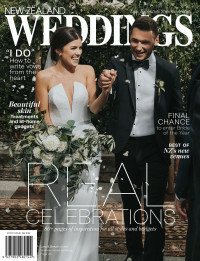 New Zealand Weddings is the must-have buy for every modern bride with over 200 pages packed with advice and inspiration to help plan the perfect day. There are over 20,000 weddings a year in New Zealand and couples spend an average of $30,000 per wedding. The typical New Zealand Weddings reader is aged between 20-39, planning to marry or remarry. She is organising her big day at least a year out, but is looking for ideas and inspiration from the moment she falls in love. Hungry for new ideas and the latest trends, she is the ultimate shopper, has money to spend on her big day and is making decisions on how she’ll spend it.